Replacement: None. This was an odd part and we ended up having difficulty keeping it in stock, so it's time for it to step aside and make room in the catalog for more cool new stuff! This page is for reference only. The ADNS-2620 is a small form factor optical mouse sensor. It is used to implement a non-mechanical tracking engine for computer mice. 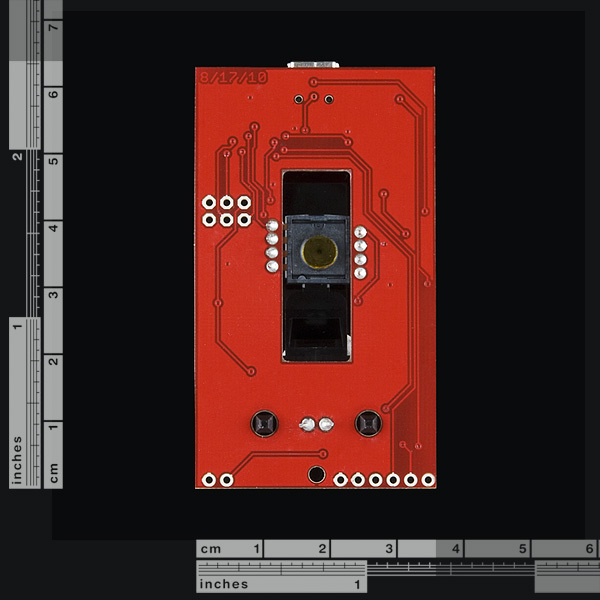 Now you can make your own optical mouse or input device. The evaluation board provides you with the necessary components to get started and some supporting circuity. Check the pictures for exactly what you're getting. You get a board with the IC mounted, top clip, bottom lens, and LED. In addition, it has a booster circuit for using a 3.7V battery for power. Also, we've included an ATmega328 preloaded with example code and an Arduino bootloader. We configured the AVR to act as an HID and therefore does not use an FTDI. For reprogramming and such, you will need an FTDI basic or similar. Plug in a USB miniB cable and this will show up and act like a mouse on your computer. It uses a ADNS-3050 sensor with a higher resolution than the 2610, I also have code and 3d models to make a mouse with it. 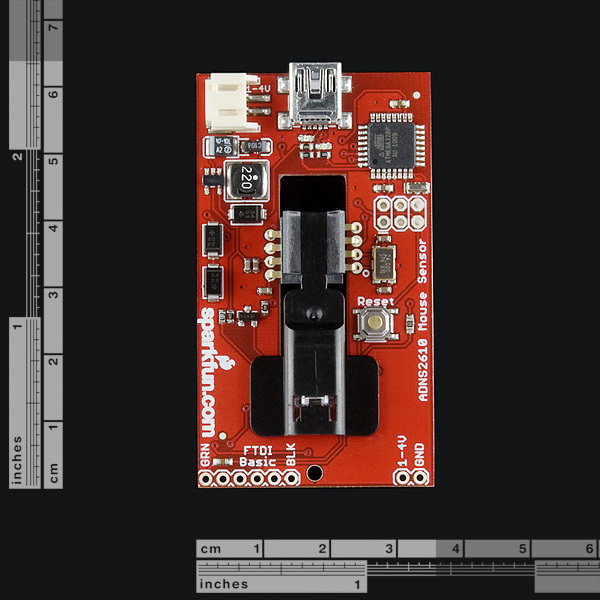 I think Sparkfun should have a mouse sensor. They are still useful for many motion tracking apps. Avago sold their mouse sensor business to Pixart (www.pixart.com). I'd recommend the ADNS-3050, ADNS-3080 or ADNS-3090. Any Chance of something like this appearing again? I found that if I wanted to rewrite the arduino bootloader to the onboard 328, the "Arduino Pro or Pro Mini (5V, 16 MHz) w/ ATmega328" was the Board closest in the Arduino IDE. at least that's what worked for me. I've made a blog post including links to the source code to use this sensor for position hold for a quadcopter. How did you work the module? I am trying to run this module with Ardunio IDE but Ardunio IDE boards section is not include that module? How will you suggest a way which running this module ? Win7 doesn't recognize this board as a mouse -- I get an 'unknown device' error, says device gives code 43. Any ideas as to how to deal with this? I have the same issue with windows7 not recognising it as a mouse.. I found (with my own variation on this board), that I had to add zener diodes to clamp the D+ and D- lines to 3.3V for the mouse to be recognized (on some PCs). I believe the USB specification calls for 3.3V. 1) Is it possible to use on Analog/Digital input of the arduino? 2) Is it possible to use on PWM pin of the arduino? 3) Can you recommend optics for further distances? It should! Please let us know how it turns out. Good stuff. I added those both above, thanks. Wait, USB HID done directly on an Atmega328? Am I missing something? Why doesn't this get used instead of an FTDI chip normally? Yep, check the schematic. For just showing up as an HID the ATMega328 serves the purpose, but you still need an FTDI for passing code to the chip. It's not an all purpose solution. 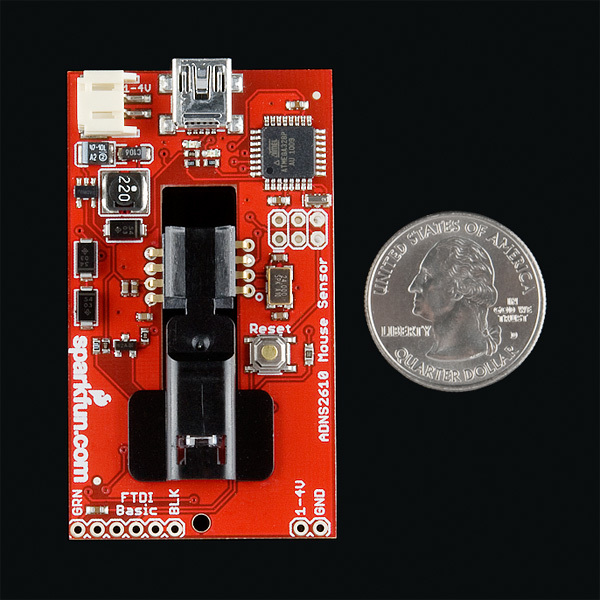 Why not flash the USBaspLoader onto the chip and do away with the need for an FTDI breakout? You've got everything you need there except a dedicated pin for selecting the upload mode. You can probably use one of B3..5 to trigger the bootloader to run the USBasp emulator code rather than jumping to the user code or maybe someone can/has patched USBaspLoader to run on a timeout like the Arduino does. I'm tempted to pick one of these up or one of the plain sensor breakouts to use as position/motion feedback on an XY table, but I have enough projects as it is. Psh, how else are we going to sell everyone an FTDI basic? Come on, margin margin margin! Kidding. But that's a good idea, maybe next rev. There is already an open-source project to do the low-res mouse scanner thing (in fact I think more than one). Problem is it is a crude debug mode, not a proper camera so you can only get one pixel per update cycle and it takes about one second to read all 300-some pixels. So you can't really move it at all, or the image is smeared. I also would like to see an infinite DOF focused lens. Glancing at the data sheet it looks like the pixel data is available. That opens up the possibility of using it as a low resolution gray-scale scanner. (18x18 pixels, 64 shades of gray) You could use it as a bar code scanner, OCR, or have a robot sense the type of surface it's moving across. Combine the pixel data with vector data to assemble a much larger image. I noticed that too. It seems like you might be able to use this for relative tracking (like mouse movement) as well as absolute tracking by looking for specific patterns (kind of like small 2D barcodes). This would let you put a few symbol stickers on a table surface and a robot could hunt for those stickers and interpret meaning from them (like "I can charge here"). You could probably also implement a combination of motion feedback and line tracking using one of these. You might think about doin' it, I am, lol.